Dr. Jacob Geyer is the owner of Golden Hills Dental and is pleased to provide you with the best dentistry has to offer. He was raised in Palmdale, CA, and after many years away, he is excited to be back in California. In 1998, Dr. Geyer served a two-year religious mission for the LDS church in the Dominican Republic. It was here that he developed a sincere passion for service to others, and learned to speak Spanish fluently. 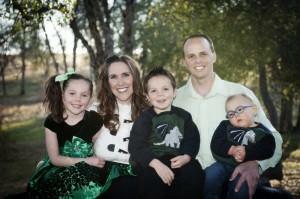 Dr. Geyer attended Utah State University, where he competed in Track and Cross Country on a full-ride scholarship. While in Logan, UT, he met his fabulous wife, Kellie, who is a dental hygienist. Dr. Geyer attended the Ohio State University, where he earned his DDS degree, graduating at the top of his class. He practiced dentistry in Richmond, VA for a few years prior to moving to Coarsegold, CA. Dr. Geyer is a firm believer in continuing his educational pursuits. He has completed a two-year course of over 500 hours of formal training to be able to provide orthodontic care to our patients. This training program for general dentists is world-renowned, and Dr. Geyer was the only one in his class to graduate the program with high honors. This exceptional training has allowed Dr. Geyer to accommodate the overwhelming need for orthodontics in the mountain community. Dr. Geyer is among only 2% of dentists in California certified in IV Sedation dentistry. Dr. Geyer is extremely skilled in placing and restoring dental implants, both simple and complex. He is prepared to provide you with virtually every option dental implants have to offer. Dr. Geyer enjoys practicing dentistry and is committed to excellence in his delivery of your dental treatment. He enjoys the outdoors, running, and spending time with his family. He resides in Coarsegold, CA with his wife, Kellie, and has four children, Reesa, Jansen, Mitchell, and Corbin.